Let us dream no longer in somber sadness that we cannot draw near to God so that he will really hear our prayer and pity our necessities, seeing that Jesus has become bone of our bone and flesh of our flesh, born a babe as we are born, living a man as we must live, bearing the same infirmities and sorrows, and bowing his head to the same death. O, can we not come with boldness by this new and living way, and have access to the throne of the heavenly grace, when Jesus meets us as Immanuel, God with us? Angels sung, they scarce knew why. Could they understand why God had become man? They must have known that herein was a mystery of condescension; but all the loving consequences which the incarnation involved even their acute minds could scarce have guessed; but we see the whole, and comprehend the grand design most fully. The manger of Bethlehem was big with glory; in the incarnation was wrapped up all the blessedness by which a soul, snatched from the depths of sin, is lifted up to the heights of glory. Shall not our clearer knowledge lead us to heights of song which angelic guesses could not reach? From a sermon entitled "Mary's Song," delivered December 25, 1864. 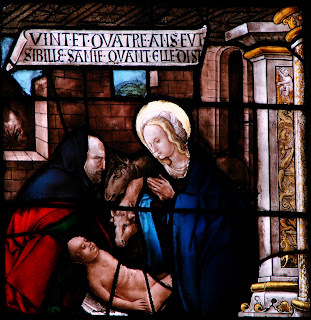 Image: one of the 18 Renaissance stained glass windows of the Cathedral of Auch by Arnaud de Moles; in the public domain.